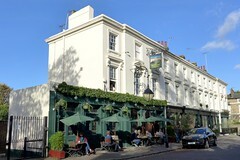 A fine traditional pub run by the Capital Pub Company, just off a side-street near Little Venice. There are wooden floors and fine panelling, and the pub is laid out over a number of rooms, but the place is well-lit and has no pretensions. Smokers crowd around the front doors, where there are also some tables. According to the website they have a range of regular ales (Adnams Broadside, Greene King IPA, Bombardier), though on Ewan's visit in February 2008 the only ones in evidence were Doom Bar and TEA ale. However, the Doom Bar was excellent as ever (£2.90/pint; Guinness was £3/pint). In October 2008 the beers were London Pride (£2.90), Sharps Cornish Coaster, and Doom Bar, while a commenter tells us that the ales in June 2009 were again Doom Bar and TEA. Food is served noon-9pm Mon-Sat and noon-4pm on Sun. The menu has the usual suspects, as well as (on occasion) more unusual options. As of October 2008 they're also advertising a steak night between 6pm and 9pm on Wednesdays, where you can get 8oz of ribeye or sirloin with onions, mushrooms, and chips for £7. In February 2008, Ewan tried the spicy fajitas with halloumi (£5.50), which were served with vegetables and sour cream. These turned out to be quite excellent, especially given the price, and my companion's sausages and mash (£7) was also heartily praised. On our October 2008 visit, the spicy fajitas were alas no longer on the menu. Hannah had the pie of the day (£8 including mash and red onion gravy) photo. It was a true pie, with pastry all the way around. ilmari's potato wedges with chilli and sour cream (£4.50) photo, bob's "sausage snack" with sweet chilli sauce (£3.50) photo, and Kake's spicy chicken wings with sour cream (£3.25) photo were all fine, and certainly reasonably priced. We also had some biltong later (Coan brand, £2.50/40g packet). Quiz night is Thursday from 9pm. It's worth noting that (at least as of October 2008) they have no minimum amount for card payments. Last visited by Kake, bob, ilmari, and Hannah, 30 October 2008. Food times taken from menu on that visit. Opening hours taken from Capital Pub Company website, February 2008. Last edited 2017-11-02 17:45:24 (version 17; diff). List all versions. Page last edited 2017-11-02 17:45:24 (version 17).